Matthew 3:13 Jesus came from Galilee to John at the Jordan, to be baptized by him. Artists made objects that supported the physical and spiritual needs of people throughout history and their work carried an imprint of the culture from which it came. When churches were established, art became a means by which biblical stories could be taught and worship enhanced. In the Western division of the Church during the Middle Ages, artists painted images of the world they knew and thus biblical figures tended to be depicted as Europeans; the architecture and natural world in their paintings were their local surroundings. During the Renaissance of the fifteenth century, as painters were becoming highly skilled, the Italian heritage of Greek and Roman art brought in a classical overlay to Christian subjects and “art” evolved to exist in a realm of its own; it tended to be separate from the reality of the everyday world. The Renaissance spread throughout Europe and the art, music, literature, science, and technology that grew out of it influenced cultures of non-Europeans as well. In recent years, a perceived need to make the arts accessible to a broader range of people led to Shakespeare’s plays being offered in a form they believed to be more palatable. Today, his plays may be seen in modern day settings with its language changed to the vernacular; the same has occurred in performances of opera. Fr. Francois Vidil of France was mindful of racial and cultural differences in people and he believed native Africans could not identify easily with biblical figures that were portrayed as white Europeans. 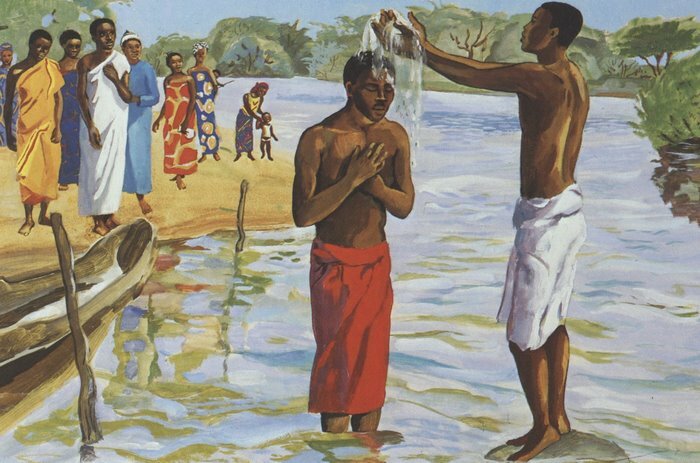 In 1973, he worked with the Mafa Christian Communities in Africa as they staged scenes such as, “John Baptizes Jesus,” (shown here) with villagers in the roles of biblical figures. These re-enactments were recorded and illustrator Bénédicte de la Ronciére was selected to make paintings from the photographs of native Africans in these scenes. These paintings fulfilled Fr. Vidil’s vision of casting Africans in the role of the people in biblical stories. Yet, just as the portrayal of biblical figures as Europeans in local settings was not accurate, neither was it accurate to depict biblical figures as African villagers. These paintings did not develop naturally out of the Mafa culture and although the scenes are in Africa, they are painted in a style common to European and American magazine illustrations. The subject matter of these paintings will receive attention undoubtedly from non-art sources and discussions about them will deal with social and cultural issues; not about aesthetics. It is unlikely they will receive attention from art critics and historians.